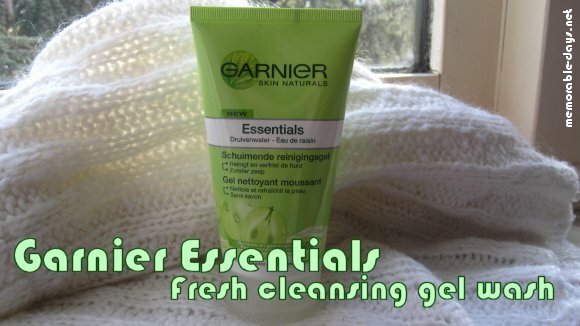 Review: Garnier Fresh Essentials Cleansing Gel Wash | Memorable Days : Beauty Blog - Korean Beauty, European, American Product Reviews. I have been using the Garnier Fresh Essentials cleansing gel wash for a year now and I'm quite pleased with it. This product is for people with a normal and combination skin. It's a gel wash which you can use daily. The main active ingredient of this product is the grape extract. This face wash is supposed to remove impurities as well as traces of make-up in order to reveal a clean and fresh looking skin. Besides, there is no soap in this product. There is 150 ml in one tube. You can use one tube for longer than a half year so €4.99 for this product aint that expensive. Aqua/ Water, Sodium Laureth Sulfate, PEG-8, Coco-Betaine, PEG-120 Methyl Glucose Dioleate, Acer Saccharinum Extract/ Sugar Maple Extract, Acrylates/ Steareth-20 Methacrylate Copolymer, Benzyl Salicylate, Butylparaben, Butylphenyl Methylpropional, Citrus Aurantium Dulcis Extract/ Orange Fruit Extract, Citrus Medica Limonum Peel Extract/ Lemon Peel Extract, Ethylparaben, Hydroxyisohexyl 3-Cyclohexene Carboxaldehyde, Isobutylparaben, Linalool, Methylparaben, Phenoxyethnol, Propylparaben, Pyrus Malus Water/ Apple Fruit Water, Saccharum Officinarum Extract/ Sugar Cane Extract, Salicylic Acid, Tetrasodium EDTA, Triethanolamine, Vaccinium Myrtillus Extract/ Vaccinium Myrtillus Fruit Extract, Vitis Vinifera Extract/ Grape Fruit Extract, Parfum/ Fragrance. interesting to see it foam up the way it does! Is dat like totally mijn infinity sjaal? LOL!!!!!! Ben ik nou zo kippig... Ik dacht altijd dat hier appelextract in zat? @ddollysweet, ahww.. kan gebeuren =( reageert anders op elk huid =( helaas. @Suzy, ja dat dacht ik ook dat er veel apple extract in zat. Ik zie alleen apple fruit water in de ingredienten lijst o_O"
Hm jammer dat er SLES in zit!! @sam, welke gebruik je op dit moment:) ?